A ‘unilateral decision’ was taken by OPEC not to cut production and to leave the daily output ceiling unchanged at 30 million barrels, despite a major oversupply that has caused oil prices to fall more than 30%. “We are not sending any signal to anyone, we are just trying to have a fair price,” OPEC Secretary General Abdalla Salem El-Badri told reporters in Vienna on Thursday. 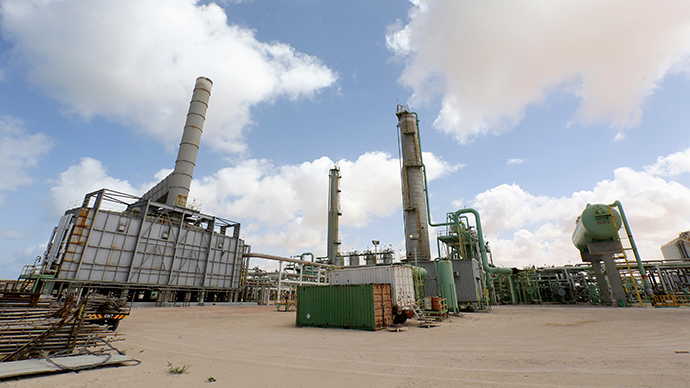 World oil demand is expected to increase in 2015, Salem El-Badri said. "I've been in this business for a long time. When I was a minister, oil was $15 per barrel. So the current price can be called good," the Secretary said. Brent Crude plunged on the news, falling more than $3 to below $75 per barrel after the Organization of the Petroleum Exporting Countries decided not to cut production. 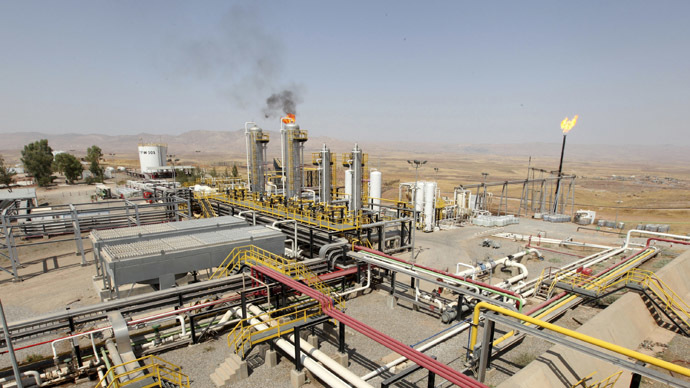 Kuwaiti oil minister Ali Saleh al-Omair, said that he was “happy” with the decision not to restrict output. “I speak on behalf of the ministers, we have no target price, we have a fair price,”El-Badri said. Oil prices have fallen more than $40 per barrel since mid-June when oil peaked at $115 a barrel. Low prices have been triggered by oversupply created by increased US production and waning demand from China and Europe. Oil ministers from the 12 members of the Organization of the Petroleum Exporting Countries (OPEC) met in Vienna Thursday. 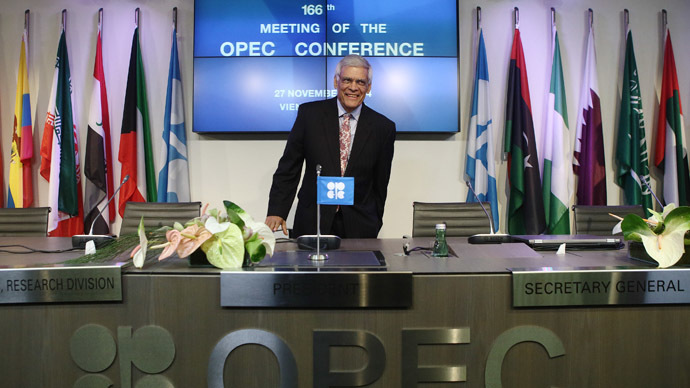 The next OPEC meeting will be held in June 2015. The decision to cut production wasn't shared by all. The cut won't negatively affect Gulf producers - Saudi Arabia, Qatar, Kuwait, and the UAE- since they can sustain lower prices, as they have trillions saved up in buffer funds. Venezuela, Nigeria, Iran, Iraq, and Ecuador were fighting to cut production to boost prices, as their economies lack the financial buffers of the Gulf States to weather low oil prices. Low oil prices help big importers like China and India because petroleum products become cheaper, but hurt exporting countries because billions in revenue are lost. Oil prices also affect currencies, such as the Russian ruble, which, in tandem with oil, has lost more than 30 percent since June. Consumers benefit from low oil prices, because it means cheaper petrol in their automobiles. Airlines make bigger margin profits as jet fuel is cheaper, and transport companies, such as a courier service or bus company, save money on petrol. Together, OPEC accounts for 40 percent of world oil output. Saudi Arabia is the largest of the 12 exporters with 16 percent of global production. The US which is not a member of OPEC pumps nearly the same amount, and Russia, also not a member, produces 14 percent. A Russian oil tycoon waned that OPEC's decision was a strike against the American market, which becomes unprofitable at $70-80 per barrel. “In 2016, when OPEC completes this objective of cleaning up the American marginal market, the oil price will start growing again,” Leonid Fedun, a board member of Lukoil, Russia's largest private oil company, told Bloomberg News. The shale boom has increased US production by 60 percent since 2008, and is on par to soon overpass Saudi output. “The shale boom is on a par with the dot-com boom. The strong players will remain, the weak ones will vanish," Fedun said. Earlier this week non-OPEC members Russia and Mexico held meetings with members of the energy cartel, but no agreement to cut production was reached. “OPEC’s decision means the problem of excess oil on the market will not be solved quickly,” Russia’s Ministry of Finance said. Other major non-OPEC energy producers are China, Canada, Mexico, Brazil, and Norway.